Check out this Video or follow the instructions below. 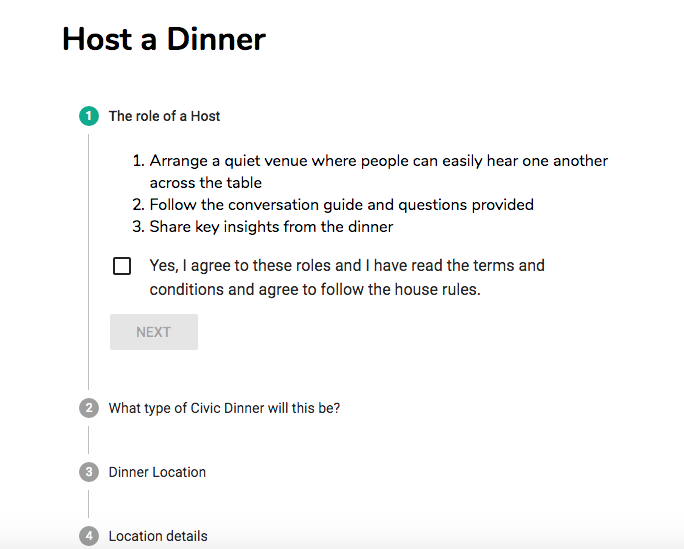 To host a dinner, first scroll down the homepage and choose a conversation. Can't pick because they're all so interesting? Pick your favorite color ;) Better yet, become a super host and host as many as you want! 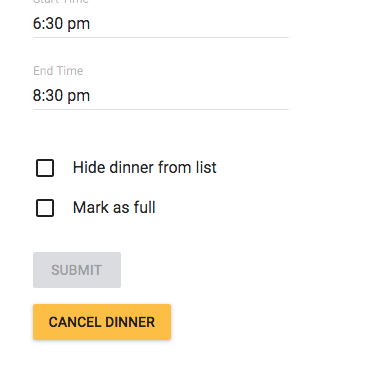 Then choose the HOST A DINNER option. Choose Open or Host Approval. You will be emailed specific details about your dinner and how to recruit guests a week before your dinner date. Choose your dinner location. Restaurant or home or community space are all great options! 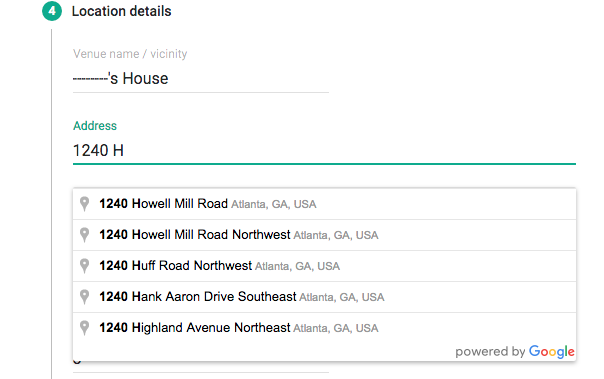 When typing in the address of the venue, type slowly and wait for the address to appear in the dropdown box. Your full address will only be visible to those who sign up for the dinner. A more general location will be given to the public to see where dinners are being held. You should see this "Success!" icon popup when you've officially registered your dinner. Yay! Next you'll want to invite guests. You and your guests will automatically receive emails from us leading up to the dinner and after to present you with the feedback survey. You will be taken to this page and any changes you make will prompt an automatic email to your guests notifying them of the change. Keep reading to learn more about what hosting looks like. The most important thing to remember when hosting, is that a Civic Dinner is all about bringing different voices and perspectives to the table, and allowing everyone equal time to share. No need to be an expert on the topic! Connection is everything for a Civic Dinner and making sure everyone can hear one another is critical. 6-10 people per table in a quiet place. Each table requires it's own host. Most of the time, simple is best. 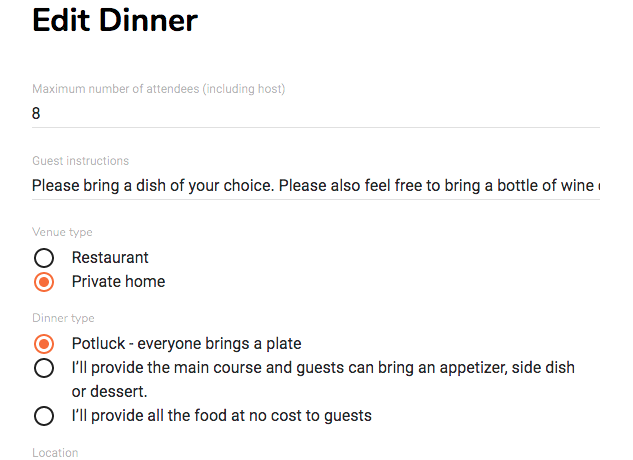 If you are hosting at a restaurant, your guests can choose from the menu - make sure you make a reservation! If you are hosting at your home, you have many options, from ordering take-aways, cooking your favorite dishes or having a potluck. Feel free to make it what you want, while being conscious of any dietary restrictions your guests may have. Once you have posted your dinner, then it’s time to invite guests. 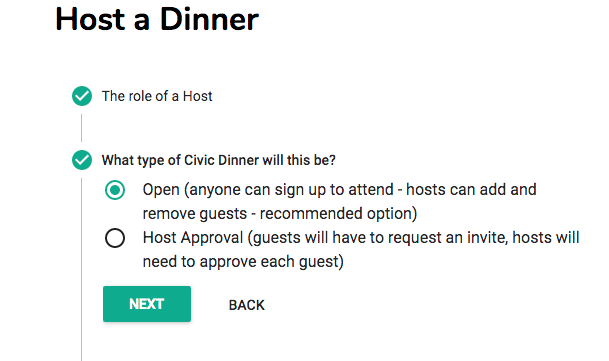 Civic Dinners will email you your event URL that you can share with friends, colleagues, neighbors or whomever you invite to attend. Personally asking people is most effective! You can also allow people to RSVP from the website who are interested in the conversation. Your address will only be visible upon confirmation. 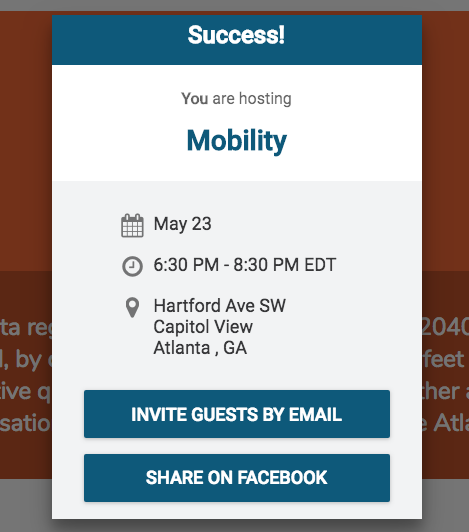 You’ll receive an email when someone RSVPs to your event and all guests will be notified of your information and can contact you directly if they need to. Once you have your guests, and it’s the night of the dinner, have the Host Guide with you at the table. This is sent to you prior to your dinner via email. This guide provides an introduction for you to share, along with host tips and the big questions with prompts. Simply follow the guide and enjoy the conversation. Feel free to take brief notes of your conversation or designate an official note-taker to help capture some of the key ideas throughout the dinner. When we’re having fun, we often forget to document. So remember to take a photo of your entire dinner, and if possible, take some photos during the conversation and tag @civicdinners on Facebook, Instagram or Twitter. We love seeing your photos and hearing your stories and experience. Also, after the dinner, we will follow-up with a survey to gather your insights. Now you know what it takes to host a Civic Dinner! 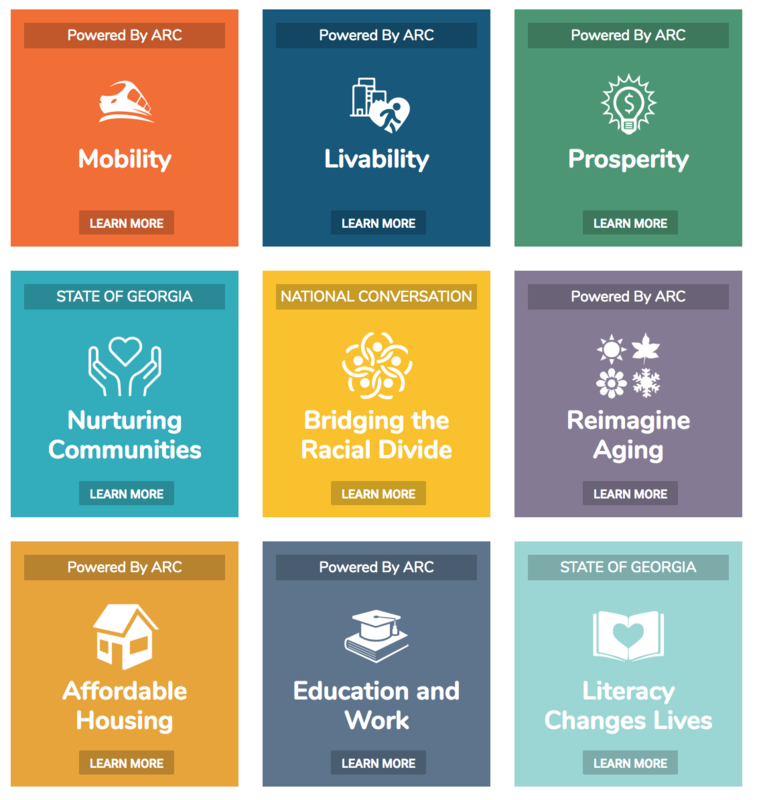 We thank you for your leadership in these important conversations and hope to see you at the table! Hosting is easy and fun!